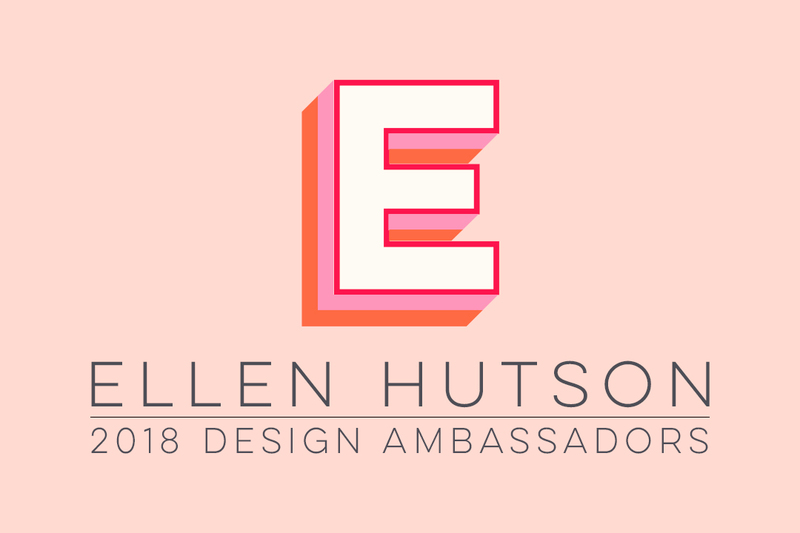 Don't forget -- Here in the CLASSroom, we're drawing a winner each day from those who participate in the challenges for a $25 Ellen Hutson store credit, so I hope you're ready to create & play! Day 5 Challenge: Mood Board <==Click here to visit Winnie & Walter's blog and to see more samples & info there! I decided to keep this as a flat card/"postcard", so to finish it I just trimmed the stamped panel a little and adhered it to a 4.25" x 5.50" panel of Ellen's Metallic Gold Leaf cardstock. I know the recipient of this card loves to keep them on display, so I backed the card with a piece of Ellen's Magnetic Die Storage material so it can easily be displayed on her fridge! I look forward to seeing YOUR Mood Board Challenge projects! Link up your project today here below or on the Winnie & Walter blog! Many thanks to the very kind folks at Winnie & Walter for inviting us to participate in their fabulous challenge week! I started by die cutting a to-go cup mask with the Essentials by Ellen Designer Dies Oh Frappe set and Inkadinkado Stamping Mask paper. I applied my cup mask to a piece of Bristol cardstock and used a blending tool & Abandoned Coral Distress ink to add color. I stamped a solid flower from the Winnie & Walter The Big The Bold and Extras in Avery Elle Strawberry ink (the perfect shade of summery red that also goes perfectly with Distress Ink Abandoned Coral). Next I created a vellum overlay, 8-1/2 x 5-1/2 and folded in half. I stamped the banner for the Winnie & Walter The Big The Bold and The Extras set in white and embossed. Then I created my sentiment with "have a" from Essentials by Ellen Totally Awesome set and "latte" from the Essentials by Ellen Oh Frappe set. To use just the "latte" from the "thanks a latte" set, I used a Versamark pen just on "latte", stamped it and embossed. I placed my vellum overlay over my stamped & inked card so I would know where to stamp my flower outlines. I added a little circle to my cup, inked with Lucky Clover Distress Ink and secured my vellum overlay with twine. Finally I added a little message on the inside of my card. P.S. Don't forget that Ellen is giving away another $25 store certificate day! Hello and hip, hip, hooray! Heather here with THREE of Winnie & Walter's Share the Love Week Featuring Essentials by Ellen. I cannot express in words how excited I was for this post!!! I love love LOVE Winnie & Walter products so to pair it up with Essentials by Ellen - YAY!!!! I had so much fun with today's challenge - backgrounds. I absolutely love a stamped background so this was really fun for me! First, I took a pink card stock card base and stamped the bokeh dots from the Essentials by Ellen Bokeh dots stamp set with White Unicorn ink. Then, right over the top, I stamped the pink hearts (from Winnie & Walter's So Tweet) - keeping with the bokeh effect - right over the white bokeh dots. I love love love this contrast! Next, I used my MISTI to position and stamp the bird on white card stock. Then, I trimmed the panel to make it more of a focal image and not cover up so much bokeh. I colored the bird in with Copics. Seriously, I adore these Winnie & Walter birds! Tied some twine to match the birdie's cheeks! I adhered the stamped birdie panel to the bokeh card base. Last but not least, I added some white gel-pen accents. Adorbs, right? Thanks so much for stopping by and taking part in the Winnie & Walter fun! I'm so glad I was able to join you! Link up your proejct today here below or on the Winnie & Walter blog! Hi everyone! Lisa here for day TWO of Winnie & Walter's Share the Love Week Featuring Essentials by Ellen. I'm super excited to be able to participate in this fun event! Today I'm challenging YOU to be a little "sentiment"al. ;) Put the focus on the sentiment with this Sentimental Challenge. I made two cards for today's event. I just couldn't help myself. I haven't been feeling very good lately so I was hoping this challenge would help spark my own creativity. My focus, of course, being on the sentiments. The cards are different from their creation level, but both really simple to replicate so I hope you'll consider that and make your own! This card came together VERY fast!! I used Winnie & Walter's awesome The Big The Bold & You stamp set and heat embossed the "You rock" with gold embossing powder onto cardstock weight vellum. By wrapping the vellum around the center of the card like this, even though there are other elements, your eyes are still drawn to the beautiful sentiment. The "diamond" rock is from the Essentials by Ellen Designer Dies, You Rock by Julie Ebersole. The diamond was first cut from gold glitter paper, then from 3D Foam Creative sheets. The two were adhered together and onto the card. I filled the recesses of the diamond with Glossy Accents and sprinkled teeny random sprinkles before dry. Add a strip of glitter tape and a few sequins and this card is DONE! I used the Kuretake Gansai Tambi watercolors to create a rainbow effect on my watercolor paper. Then I used the Copper-y color to create a kind of stripe or ridge on the diagonal for interest. I am totally okay with my colors getting blendy and drippy. I just think that adds to the effect and makes it look far more interesting. Once it's completely dry, I stamped all my little floral images in Versamark ink from the Winnie & Walter Clear Stamps, In Bloom - Eva's Favorite Flowers. The images were then heat set and embossed with Copper Embossing Powder. To draw your eyes to the sentiment of this card I knew I needed to make it extra special! I used the Essentials by Ellen Designer Dies, Many Thanks by Julie Ebersole and first die cut it from 3D Foam Creative Sheets (black) and adhered into place. I then die cut the sentiment again from iCraft Deco Foil Peel n Stick Toner Sheets. Once it was die cut this second time I was able to run it through my foiling machine with the Wow! Fab Foil in Purple. Since it has adhesive on the backside I then adhered the foiled piece to the foam piece. I added a few additional sequins and a tiny strip of patterned paper along one edge, for interest. Fun, right?!! I hope these two cards got your sentimental hearts beating for this challenge!! Be sure to come back tomorrow for Day 3 and more challenge inspiration during Share The Love Week with Winnie & Walter featuring Essentials by Ellen! We will be drawing a name from each day of participating challenges to win a $25.00 store credit! Good luck! I used the flowers in The Big, The Bold & Extras set for my design--they're the perfect size for pulling of this effect! Be sure to come back tomorrow for Day 2 and more challenge inspiration during Share The Love Week with Winnie & Walter featuring Essentials by Ellen! Have you heard of Winnie & Walter's Share the Love Week? Next week our design team will join forces with the Winnie & Walter team to share some fabulous projects and challenges with you! Be certain to join us between June 20-25 here in the CLASSroom to be inspired, have some fun and enjoy savings and gifts! We are thrilled to have Kelly Griglione here with us today as she kicks off this special event! Kelly's work has caught my eye on many occasions - her work is so very clever, precise and BEAUTIFULLY done! When I met her at CHA I had to ask for her card so that I would be able to get in contact with her --- I knew I would like to have her share her work with you here in the CLASSroom. Kelly showcases all sorts of ingenious ideas on her blog Notable Nest. I would like to encourage you to head over there and bookmark it as well as share some comment love with her thanking her for sharing her creativity with us here in the CLASSroom. Look for the post where Kelly shares a peek at the projects below along with the opportunity to randomly win a $50 shopping spree in our store! Stay tuned here in the CLASSroom and head over to Winnie & Walter's blog next week as we share incredible samples and challenges! Hi folks! I'm am absolutely thrilled to be joining you in the CLASSroom today! It's such a pleasure to be "Sharing the Love" with two of my very favorite stamp companies, Essentials by Ellen and Winnie & Walter. I've been itching to play with the Mondo Hydrangea stamp and die set from the Essentials by Ellen Winter Release. The hydrangea was instantly popular, selling out on the very first day of the release, if I recall. For this post I'd love to take a bigger picture approach and share ideas on how to use the stamp set, instead of focusing on how to make one particular card. Even if you don't have this exact stamp set (although, seriously, why don't you?!?) you can apply these ideas to virtually any large, detailed stamp you own. So let's get to it! 1) Stamp it on patterned paper. It always amazes me how little you notice, if at all, the underlying pattern when you color a stamp directly on patterned paper. The key is picking something with either a subtle pattern, and/or one without strong colors. These hydrangeas were painted with watercolor, and you can see on the right, where I've used multiple colors, that the triangle pattern doesn't show through. On the left, where I've just used one light color, you can still slightly see the triangle pattern, but it's not disruptive to the overall image. A nice benefit to this technique is that it gives the look that you fussy cut the image and adhered it to patterned paper, without all the effort of fussy cutting! 2) Stamp it as a background. With large stamps like this, it’s SO EASY to quickly cover your card base. This is a great idea for when you need to make multiples of cards, like for a set, or for a particular occasion (end of school teacher cards from a couple weeks ago!) When you have a large stamped base like this, you don’t need to spend a lot of time or effort making the rest of the card shine, so that’s when I pull out one of the large Winnie & Walter sentiments, like this one from In a Word: Hello. For the background of the card I used a few different shades of aqua ink, making sure to stamp the darker colored ink on either side of the sentiment to balance it out. The Hello die has a layer of black fun foam underneath for dimension. I probably could have stopped there, but I ended up adding a cute felt bow from Winnie & Walter Take a Bow, and a tiny heart that I outlined. 3) Make a unique patterned paper. Have you noticed how popular adult coloring books have become, with super detailed, black and white images to color in? This technique mimics that look with lots of detailed black “scribbles” acting as a patterned paper. I started out stamping the large hydrangea the same way I stamped it for the background of the previous card, completely covering the card base without overlapping the images at all. Then I rotated the card base and stamped another full background, taking care to not line up any of the flower images, and not to overlap the overall flower image. This results in an evenly scribbled pattern. For the sentiment, I stamped and embossed Winnie & Walter’s The Big the Bold and Friends on the heart from Winnie & Walter’s Flawless Heart Cutaway. The heart is outlined with a white gel pen. Also, not sure if you’ve noticed so far, but I really enjoy cutting 4 ¼ x 5 ½ pieces of patterned paper to line the INSIDES of my cards. The inside is half the real estate of your card after all! When it’s time for me to write inside the card I’ll grab a few pieces of paper from my scrap drawer, adhere those on the inside, and write my message. 4) Stamp on a die cut. You don’t always have to use the entire image, especially when working with such large stamps as the Mondo Hydrangea. Sometimes it’s nice to use the image to fill the inside of a smaller die cut. Using the same Flawless Heart Cutaway from Winnie & Walter, I stamped the Mondo Hydrangea once and then started coloring in the petals with my Copics in pink and coral colors. To get a different look than the colored hydrangeas in the first card, I colored the negative spaces in a dark gray. Not having any white on the heart gives it a rich feel, almost like a pattern you would find on fabric. The sentiment is another one from Winnie & Walter’s The Big the Bold and Friends. The heart is backed with black fun foam for dimension. I ran a dark gray marker along the edges of the heart to make sure there wasn’t any white showing. 5) Make a shaped card. Bonus points for making it 3D! These cards are always good for when you have an odd-shaped present for someone and just want to tie on a little note card, instead of figuring out how to attach a larger, A2-sized card. Large stamp and die combinations like the Mondo Hydrangea are perfect for this purpose. To make a shaped card, you want to position the die so it’s hanging off the fold of your cardstock. That way, when you run it through the die cutting machine, the two shapes will remain connected by the fold. Once you have the folded card base cut, you’ll want to cut another layer as you normally would, and adhere that to the base. This will give you a full image to stamp and color on. I’ve used a selection of blue and purple Copics to color the petals. Here’s where the 3D opportunities come in … the Mondo Hydrangea set comes with two extra flowers for you to add separately to your main hydrangea image. Once I cut, embossed and colored three of these flowers, I cut in between the petals so I could bend each one up from the center. I really love how this makes the flower come alive! The sentiment is from Winnie & Walter’s Bubble Talk, and is tucked underneath one of the 3D flowers. When I use thin strips of paper like this for a sentiment I like to curl it slightly with my fingers so it looks like a flag blowing in the breeze.